Disney's D23 Expo brought the voices of some of the most iconic Disney princesses together and now they want to team up for their own crossover movie in the vein of Avengers: Infinity War. The unprecedented real-life union came together while Disney Animation unveiled a new clip from the forthcoming Ralph Breaks the Internet: Wreck-It Ralph 2 where Vanellope von Schweets decides to have a bit of fun with the princesses after her and Ralph find them in OhMyDisney.com, the happiest place online. The women behind the voices arrived on stage to thunderous cheers and applause. After the Animation panel, Fandango's official Facebook account posted a video of most of the actresses being asked if they'd be interested in doing an Avengers-style crossover. Every single actress interviewed excitedly said, "yes." Auli'i Cravalho (Moana) said, "We're on camera, you need to quote that because that is such a great idea." Mandy Moore (Rapunzel) said, "Yeah, sign me up. Where's John Lassester? I'm so down for that." And why not? It is a great idea and would probably be huge at the box office and even bigger on the merchandising aspect. 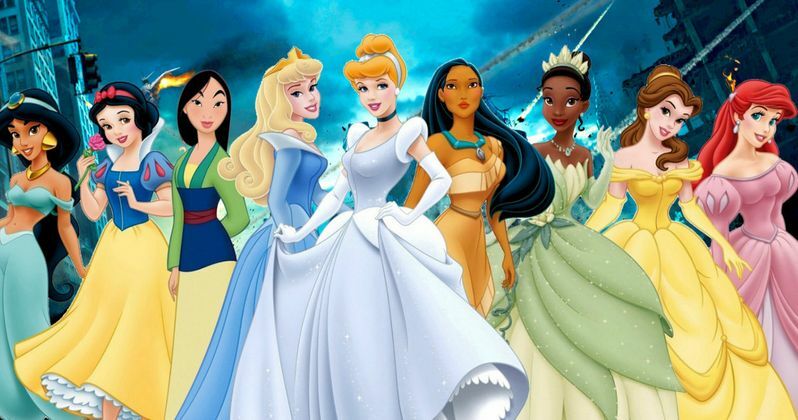 It's obviously working wonders for Marvel and Avengers: Infinity War, so why not try an all female Disney Princess version? The Wreck-it-Ralph 2 footage reactions should be enough to put the idea into motion. Maybe even Captain Marvel can get a cameo, which could also include Rey from Star Wars. The idea is almost too perfect and one has to wonder if the idea crossed over the collective brass at Disney after making the footage for Wreck-it-Ralph 2. It seems like it would have had to and besides, animation would certainly be a heck of a lot easier (and cheaper) to pull off than the live-action of Infinity War. Fans lucky enough to be in attendance were the first to see the clip and witness the union of the princesses. No Disney fans in attendance will ever forget seeing Auli'i Cravalho (Moana), Kristen Bell (Anna in Frozen), Kelly MacDonald (Merida in Brave), Mandy Moore (Rapunzel in Tangled), Anika Noni Rose (Tiana in The Princess and the Frog), Irene Bedard (Pocahontas), Linda Larkin (Jasmine in Aladdin), Paige O'Hara (Belle in Beauty and the Beast) and Jodi Benson (Ariel in The Little Mermaid) on stage for the largest gathering of Disney princesses in history. Backstage it was selfies for all that were involved and everybody was clearly having an amazing time being together like that. While the idea of an all Disney Princess, Avengers-style crossover does seem like a great idea, it might not be the direction that Disney is currently moving since they seem to focusing on live-action remakes of all of their classic animated movies. But who knows? Only time will tell at this point, but one thing is for certain: The Disney princesses are up for the battle and the idea is a solid one. Check out the video interviews from the actresses below and check out some backstage pictures of the event below.